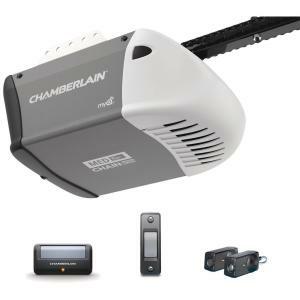 If you’ve looked at the garage door opener market recently, you’ve undoubtedly noticed a large number of competing for brand names available to consumers. The wide variety is always great for being able to select that perfect garage door opener for your needs, but the selection can sometimes feel overwhelming. This is where the experts at Canadian Garage Door Repair Vancouver step in: we have more than 15 years of experience working with all of the major makes and models of garage door opener and can make professional recommendations for your particular needs. We highly recommend LiftMaster Chamberlain and Genie garage door openers above all other brands because they have proven themselves as being the most extended lasting products available. The top name brands also have extended warranties and high customer satisfaction ratings to provide our clients with worry-free garage door opener use for many years to come. We’ll make sure you’re fully informed about your garage door opener repairs and have all the facts before we begin any repairs as part of our ongoing dedication to mutual understanding and your 100% satisfaction. If you are looking for a smooth and powerful garage door opener, count in a belt drive opener. Homeowners with rooms above or next to the garage appreciate the smooth and quiet functionality of the belt drive opener. As like most of the common garage door openers, belt drive feature powerful ¾ and ¼ HP lifting motors. At Canadian Garage Door Opener Repair, we are happy to suggest an opener. 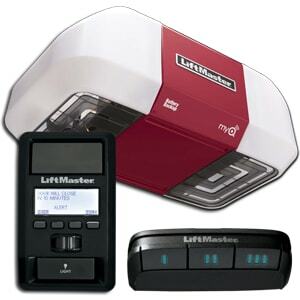 We are happy to recommend LiftMaster openers for their durability and dependability. Plenty of features makes LiftMaster the top choice for residential garage doors. Because there is such a wide variety of garage door openers available today, chances are you might have a completely different name or model than your neighbor. but you don’t have to spend hours researching a company to repair your specific brand or model because Canadian Garage Door Repair is certified to perform warranty repairs on all major brands and models of garage door opener. Our technicians have many years of experience working with the various brands and models and can repair any problem you might have. From chain drive garage door openers to belt drive and screw drive garage door openers along with any broken part or troubleshooting experiences, Canadian Garage Door Repair will inspect your garage door opener to isolate the problem and can then offer expert advice and on the spot repairs. Today’s garage door openers are much more advanced than in the past. Thanks to MyQ Technology (available with certain LiftMaster models), homeowners can open and close their garage doors anywhere in the world using a computer or smartphone. DC battery backup is available with many top brand openers. If the power goes out, have no fear. Garage door openers with DC battery backup will keep on working, even when the electricity does not. Screw drive openers feature less moving parts than belt and chain drive openers. Since it features less moving parts, it is ideal for both cold and warm climates. If you are looking for a relatively maintenance-free garage door opener, consider one of the screw drive openers. 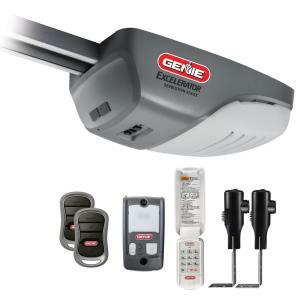 Canadian Garage Door Repair installs any garage door opener. In addition to installation, we repair the trolley, motor, tracks and other opener parts. Contact us at 778-805-4911 for more information.